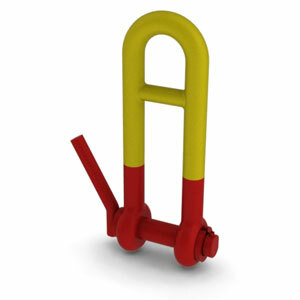 The #59A shackles were specifically designed for pulling sheet piling. They are equipped with an easy opening pin which will not detach and become lost. No tools are required. Max opening with pin in open (unlocked) position. Safety factor of 5:1. The #159A Ground Release Shackle now comes in two sizes, 8T and 12T. Each is equipped with a #320 Bolt Type Anchor Shackle for lifting and handling. These specialty shackles are built with high strength steel and come with a 12" stainless steel release cable with thimble (not shown in picture). Safety factor of 4:1.